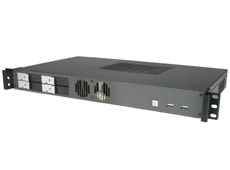 Easy-to-rebrand 1U expandable rackmount with Hot-swap bay for 4x 2.5" hard drives for use in network attached storage or RAID arrays. Assembly required. 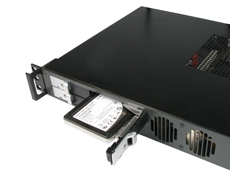 RAID arrays and network attached storage applications can benefit from the MK101's front-accessible hot-swap bays, which can accommodate up to four 2.5" hard drives or SSDs, which lock for added security. Providing maximum flexibility for applications ranging from firewalls to automotive surveillance systems, the MK101 is designed to accommodate a variety of power supplies. DC/DC PicoPSUs and a 250-watt Flex-ATX AC/DC power supply support global standards for 120-250 VAC at 50~60 Hz, while automotive power supplies such as the M2-ATX or DCDC-USB feature 6~30 V wide DC input and ignition-sensing capabilities for vehicular applications.